Web Of Spider-Man supporting character, Nightwatch, debuts in his first true clash with Spider-Man, and tackling a major new villian! After ten years of self-imposed exile, Nightwatch returns to New Yorkt o complete the cycle of his catastrophic legacy in this new monthly series! The mysterious Nightwatch, covered in perpetual darkness by his powerful cosume, seeks answers to his origin and the loss of his long-lost love. Ten years ago, Dr. Kevin Trench mysteriously came to posses the powerful Nightwatch costume. Failing to save his love from a plane hijack, Dr. Trench hid from the world on a desolate island. His road to discovery begins with a search for the truth to his past, which happens to be our future! Standing in his way is a vicious new enemy, hellbent on keeping him from discovering the facts! Will the appearance of Spider-Man in the first issue help Nightwatch succeed, or will the truth remain hidden forever? Nightwatch flies to Alcatraz Island to save some reporters who have been abducted by tech powered terrorists called the War Force. He engages the enemy but only Spider-Man’s interventions takes them down and leaves their leader fleeing. Nightwatch pursues the villain and manages to save many bystanders and take the villain down. Before he can get the answers he needs his captive goes into coma. Cover- This cover still holds up pretty well considering it came out in the 90’s. We have the Nightwatch logo in big bold red and white at the top while our titular star sits perched on a rooftop with his cape blowing in the wind. The rather bland background except for the moon really allows the hero to literally pop right off the cover. Action- This is a 90’s comic and so we have fisticuffs aplenty, explosions, laser blasts and webs. Art- I was surprised how well the interiors aged all things considered. Our Hero’s costume looks great on every page along with the well proportioned bodies present throughout. 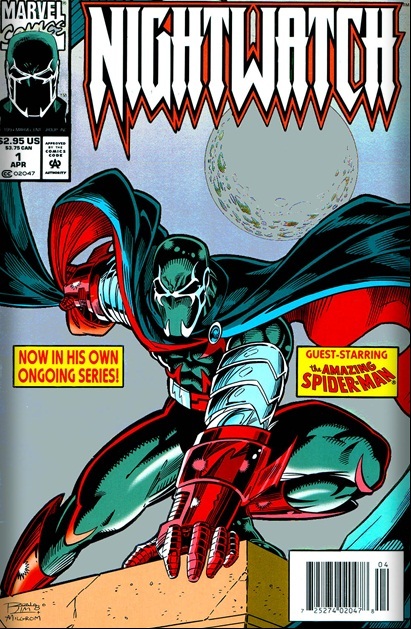 Black Hero– This was the Debut of Nightwatch (in his own ongoing series) back in the 90’s and despite my initial reservations about re reading this issue it wasn’t as bad as I remembered. 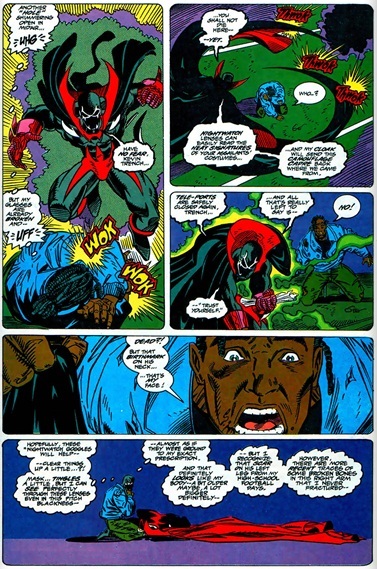 In fact I think it was a pretty solid debut even if we can draw parallels between Nightwatch and Spawn. I mean do we hold it against Blue Marvel and Icon that they have similarities to Superman? Marvel’s Spawn- So It’s pretty obvious that that there are a more than a few similarities between our hero and Spawn, prehensile conscious costumes, black hero in the costume etc. That was always Nightwatch’s problem in the 90’s and may well have prevented him from the revival so many 90’s creations have gotten in the new millennium (I’m looking at you Cardiac).